Browse content similar to Series 30. Check below for episodes and series from the same categories and more! The antiques challenge comes from Detling Antiques Fair in Kent. Nick Hall and Jeremy Lamond help the teams, and Tim visits Traquair House near Peebles. David Barby and James Braxton advise the teams at Detling Antiques Fair. Tim Wonnacott and the teams are hunting for bargains in Kent at Detling Antiques Fair. Two men reveal their knowledge of kitchen utensils to a bemused Philip Serrell in Exeter. 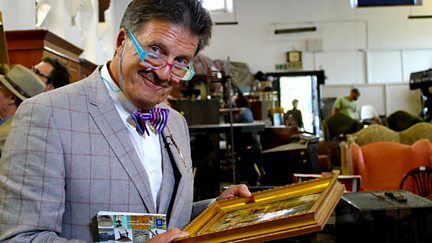 Tim Wonnacott presents a hunt for bargains from Wetherby Racecourse. Two teams of bargain hunters are let loose at the Royal Cornwall Showground in Wadebridge. Tim and the teams hunt for bargains at the Royal Cornwall Showground in Wadebridge. Experts Paul Laidlaw and Thomas Plant help the teams in Yorkshire. Paul Laidlaw and Thomas Plant help two teams at Wetherby Racecourse Antiques Fair. Expert Nick Hall bumps into a past Bargain Hunt team while helping a duo in Edinburgh. James Braxton and David Barby help the teams in Kent, and Tim visits Scotney Castle. Tim Wonnacott takes an excursion to visit Castle Howard in North Yorkshire. The red and blue teams scour Edinburgh Antiques and Collectors Fair for bargains. The teams are helped by Catherine Southon and Philip Serrell in Exeter. Tim Wonnacott visits St Michael's Mount and discovers a clock with an important role. Tim Wonnacott visits Sherbourne Castle in Dorset. Tim Wonnacott takes a look at the meaning behind George Howard's artwork at Castle Howard.